“Some of the people Jamie first worked with years ago are still talking about their experience. It's be life-altering for them. Teams have lower turnover rates and they have great Employee Opinion Scores. They're delivering strong results and they are getting noticed as effective leaders." 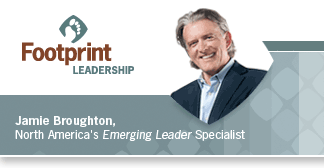 Why the Emerging Leader Challenge™? Footprint Leadership’s Emerging Leader Challenge™ (ELC) is a transformational leadership coaching solution specifically designed to accelerate the development and performance of your promising people quickly and easily. The attitudes, perspectives and skills they master in the leadership coaching program will chop years off their development cycle. Your emerging leaders will be positioned to effectively take on more responsibility and dramatically increase their impact. Your leadership performance goals for the emerging executive leader will quickly become a tangible reality.